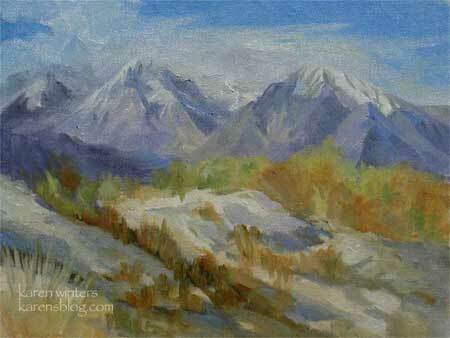 A California original impressionist oil painting, inspired by autumn in the Eastern Sierra Nevadas. Mt Abbot and Mt. Morgan are featured rising above the Owens Valley, dressed in fall colors. Wildflowers still bloom, contrasting boldly with the brilliant blues of the mountain and skies. Although the mountaintops seem tranquil we were told that 90 mph winds were blowing off the summit. Down in the valley gusts blew us around as well. That is a beautiful area but it does tend to be windy often. We used to drive up that way pretty often… not so much anymore, but maybe you’ve inspired me to go back soon. We used to have a friend who had an alfalfa ranch just north of Bishop … so gorgeous… AND we used to ski a lot. I’m not skiing any more… many reasons… But it would still be nice to visit. Thanks for making me think of it!! 1 . Inside the “about” menus, the item says my very own model will be some. 2 . not some (8E200) if that helps.